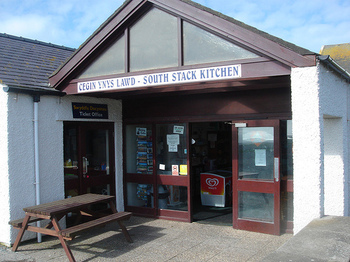 The South Stack Kitchen is a lovely place, perched on a windswept cliffy hill above Holyhead. 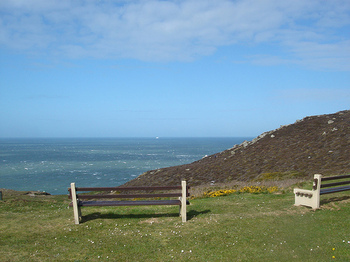 There's fine bird-watching all around, you can wonder down to South Stack lighthouse or just sit and marvel at the view. 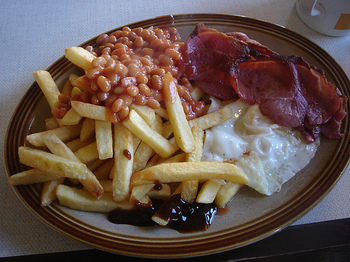 Or you can just pop in here for a splendid and enormous fry-up. I like the randomness of this one. The beans, especially, seem to have dropped from the ceiling onto the plate, but that adds to the appeal. A very nice quantity of tasty bacon, with just a little hint of crispy carbon. The chips are appealingly scattered too, you feel if you ran a special chip magnet under the table you might get them in alignment, but, sadly, there's no such thing as a chip magnet. The eggs are solid and generous and stable, sitting there nicely, holding all the randomness together. Sorry, that's a bit of a ramble isn't it? Anyway. Very tasty. Very nice. 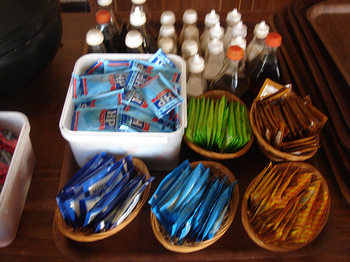 All the condiments you could ever want. 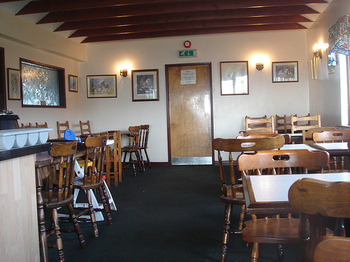 It's a nice big place inside, very much a shelter from the windy elements. Like a cosy cave. I liked it here a lot. An unexpected treat. 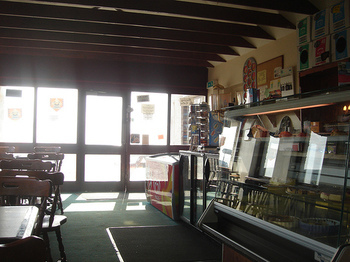 You're expecting a bracing walk down to the lighthouse and then you find this magnificent cafe, friendly, generous, welcoming. Fabulous - just the place after a bracing walk on the cliff. Makes me want to go to Anglesey. There's a castle there, too. The beans, especially, seem to have dropped from the ceiling onto the plate, but that adds to the appeal. My only experience of Anglesey was getting locked in the Sea Zoo after closing. We could have done with one of those breakfasts after that experience! I like the idea of a lovely cafe on the edge of a cliff. You should do a special caff with a view series. What could be better? Was just toying with the notion of buying your book from Amazon and clicked on your name. The book listed immediately below yours was 'The ABC of Heart Failure' which is surely whatever the opposite of serendipitous placement is called (sod's law?). it's brilliant, it actually made me hungry as a i was eating my indian takeaway supper. hooray for Wales and scenic saturated fats! your blog is a breath of fresh air, quite literally in this post. i applaud you sir. may your belly swell to a healthy paunch filled with delicious fry ups the land over! Dr Hunger Cafe, on the cornder of East End Road and Ossulton Way. Really close to the bottom of the M1 or near the North Circ if you're heading that way. I know I am coming rather late to your blog and perhaps you have covered this topic already but I do wonder if you have considered the role of the sausage in these situations? Has the Alan Partridge point about the sausage acting as a kind of barrier between the egg and the beans been taken on board? Or perhaps you think there is no sausage role? There *is* such a thing as a chip magnet. I am a chip magnet. OK, this might be a dumb question, but what is the sauce I see on the chips sometimes?